In many instances, more is better. 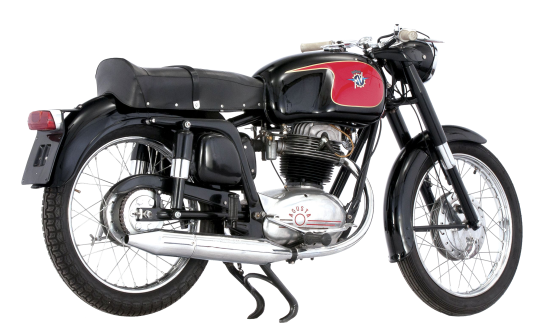 This was certainly on the minds of MV when the Tevere 235 was unveiled in 1959. Based on the popular 175 AB engine, the Tevere 235 used a larger displacement in an attempt to appeal to buyers wanting more power than the 175 could deliver. The Tevere 235’s engine used the same stroke as the smaller powerplant, but the bore was increassed. The resulting 13 HP could move the Tevere 235 to a top speed of 110 kph. Visual differences between the 175 AB and the Tevere were minimal: a box that hid the battery and air filter, and an upper engine breather pipe. Unfortunately for MV, this approach to “more” didn’t pan out, as most buyers wanting to step up from the 175 didn’t want a bike that looked like the one they just had. Instead, the opted for the Raid. Soft sales for the Tevere 235 doomed the bike to a life span of only 2 years.